Multi-material main shell construction with abrasion and tear resistant panels. CE certified knee protectors. Internal knee compartment allows adjustments of protection to fit it various leg lengths. Fixed Drystar membrane. Long lower leg zippered opening. Long direct ventilation zippered opening strategically placed across the thighs. Pre-curved leg construction for enhanced fit and comfort in the riding position. Dynamic stretch panels around crotch, waist and back of knees for ease of movement. Stretch accordion panels above the knees for ease of movement. Integrated high-visibility reflective details on lower legs to improve rider visibility in varying light conditions. Hook-and-loop waist and leg adjustments for precision fit. Hand pockets. 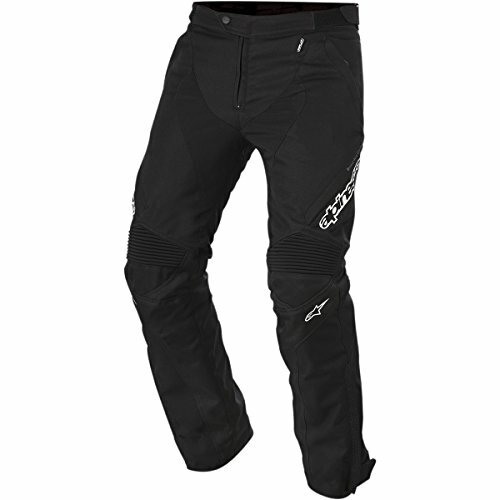 Waist connection zipper for secure integration with Alpinestars riding jacket. Hip pad compartments with PE comfort padding. YKK zippers.